There are many tennis “fundamentals” that have articles dedicated to them. The net approach. The forehand grip. How to get topspin on your shots. But before you can do any of that effectively you need to most fundamental building block of them all. Footwork. There is one thing that the professionals do better than amateur and semi-pro players consistently, and this is getting their feet in the right position to play the shot that they want. Not having the right tennis footwork means you hit your shot too early, too late, without power or simply put yourself in a position to not make the shot at all. With that in mind we thought a whole article on some basic footwork techniques, as well as a few more advanced ones would be a great idea to get you to think about your feet as much as you think about your arm, racquet and groundstrokes. The ready position is the only step that is common to every single shot you will play on a tennis court. It is the foundation your footwork, and without it, the game you build will not be as strong. The reason to adopt the ready position is that it is the best physiological stance to attack or defend any shot, by percentage. Think of it as the crouch that a sprinter takes before taking off for the 100 metres. There are other options, of course, but none is as efficient or effective for the purpose of being most ready for the most number of shots. Your feet should begin shoulder width apart, or a little wider if you are a shorter player. Both knees should begin bent, but only at a slight angle. If you bend too deeply you won’t be able to leverage the power in your legs and spring off as fast in the direction you want. Also keep in mind that your weight should be forward, as resting on your heels will also sacrifice crucial reaction time. A mistake that a lot of younger players make is having the racquet off to one side, or hanging next to their hip. The ideal position for your forearms is at 90 degrees to your body and slightly in front, with the racquet in the centre. Your non-dominant hand should be relaxed on the neck of the racquet ready to drop off for a one handed shot or slide down to the grip for a two handed return. The split step is the first movement you make, and again, it can be consistently repeated through most shots. It’s a lot like the slight twitch that a boxer makes as they dance around the ring. You should only be aiming to get your feet the slightest distance off the ground. The idea is the same as the sprinters crouch – to get your body moving as fast as possible. It is much more efficient to do this from a moving, rather than a standing start. The ideal time to execute this move is once your opponent has begun their shot. This is because predicting where your opponent will hit their shot is a high-risk strategy, and you need to be able to go in any direction to set up for your return. The good part about this motion is that with sheer repetition and practice you can improve your reaction time and how well you time your split step. This means that you gain valuable split seconds on every shot. The first step in the chain after your split step is called the initial movement or first step. First rotate your body in the direction that you will move then pivot your back foot and push off it to get your momentum moving in the right direction. The ideal movement mirrors what you are doing with your upper body, in terms of shoulder rotation and driving toward the ball. A handy way to check is to have someone video you and see whether your body is moving in sync. A common mistake is the footwork lagging the shoulder turn, as upper body movement is passive and lower body movement active for most players. A most common mistake that I saw players doing is side stepping to the ball to hit it. Obviously the best and fastest way to get to the ball is to run towards it and prepare your back swing at the same time. Always maintain a good balance before you hit the shot. For the recovery, if you are not far off from the centre, side shuffle to the centre and get ready for the next shot. However if you are near the sideline after hitting the shot, my suggestion is to do a crossover step and then followed by a few side shuffle steps to go back to the centre. This is far more efficient then side shuffling all the way from the sideline to the centre. These are just a few of the basic skills that many players do not focus enough on. As a result, there are weaknesses in many games that can be corrected by practising and repeating these tennis footwork. 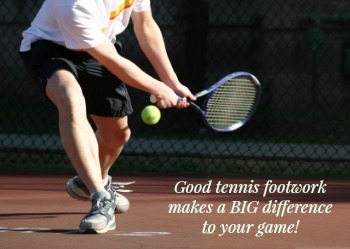 Once perfected, you truly have the foundation for a great tennis game. From "Getting Tennis Footwork Like The Pros" To "How To Play Tennis Efficiently And Become A Better Player"